The geomicrobiological characterization of the water column and sediments of Río Tinto (Huelva, Southwestern Spain) have proven the importance of the iron and the sulfur cycles, not only in generating the extreme conditions of the habitat (low pH, high concentration of toxic heavy metals), but also in maintaining the high level of microbial diversity detected in the basin. It has been proven that the extreme acidic conditions of Río Tinto basin are not the product of 5000 years of mining activity in the area, but the consequence of an active underground bioreactor that obtains its energy from the massive sulfidic minerals existing in the Iberian Pyrite Belt. 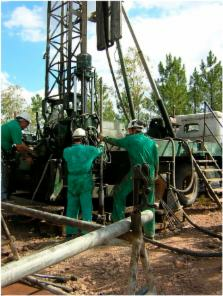 Two drilling projects, MARTE (Mars Astrobiology Research and Technology Experiment) (2003–2006) and IPBSL (Iberian Pyrite Belt Subsurface Life Detection) (2011–2015), were developed and carried out to provide evidence of subsurface microbial activity and the potential resources that support these activities. The reduced substrates and the oxidants that drive the system appear to come from the rock matrix. These resources need only groundwater to launch diverse microbial metabolisms. The similarities between the vast sulfate and iron oxide deposits on Mars and the main sulfide bioleaching products found in the Tinto basin have given Río Tinto the status of a geochemical and mineralogical Mars terrestrial analogue. Mesoscale iron enrichment experiments 1993-2005: synthesis and future directions. Since the mid-1980s, our understanding of nutrient limitation of oceanic primary production has radically changed. Mesoscale iron addition experiments (FeAXs) have unequivocally shown that iron supply limits production in one-third of the world ocean, where surface macronutrient concentrations are perennially high. The findings of these 12 FeAXs also reveal that iron supply exerts controls on the dynamics of plankton blooms, which in turn affect the biogeochemical cycles of carbon, nitrogen, silicon, and sulfur and ultimately influence the Earth climate system. However, extrapolation of the key results of FeAXs to regional and seasonal scales in some cases is limited because of differing modes of iron supply in FeAXs and in the modern and paleo-oceans. New research directions include quantification of the coupling of oceanic iron and carbon biogeochemistry. Phyllosilicates on Mars and implications for early martian climate. The recent identification of large deposits of sulphates by remote sensing and in situ observations has been considered evidence of the past presence of liquid water on Mars. Here we report the unambiguous detection of diverse phyllosilicates, a family of aqueous alteration products, on the basis of observations by the OMEGA imaging spectrometer on board the Mars Express spacecraft. These minerals are mainly associated with Noachian outcrops, which is consistent with an early active hydrological system, sustaining the long-term contact of igneous minerals with liquid water. We infer that the two main families of hydrated alteration products detected-phyllosilicates and sulphates--result from different formation processes. These occurred during two distinct climatic episodes: an early Noachian Mars, resulting in the formation of hydrated silicates, followed by a more acidic environment, in which sulphates formed. the IPBSL Team: Victor Parro, José Antonio Rodríguez-Manfredi, Monike Oggerin, Mónica Sánchez-Román, Francisco J. López, José Pablo Fernández-Rodríguez, Fernando Puente-Sánchez, Carlos Briones, Olga Prieto-Ballesteros, Fernando Tornos, Felipe Gómez, Miriam García-Villadangos, Nuria Rodríguez, Enoma Omoregie ( Centro de Astrobiología, carretera de Ajalvir km 4, 28850 Torrejón de Ardoz, Spain); Kenneth Timmis, Alejandro Arce ( Institute of Microbiology, Technische Universitat Braunschweig, D38106 Braunschweig, Germany ); José Luis Sanz ( Departamento de Biología Molecular, Universidad Autónoma de Madrid, Cantoblanco, 28049, Madrid, Spain ); David Gómez-Ortiz ( ESCET-Area de Geología, Universidad Rey Juan Carlos, 28933 Móstoles, Madrid, Spain). [* ]Author to whom correspondence should be addressed; E-Mail: ramils@ 123456cbm.csic.es ; Tel. : +34-911-96-45-04; Fax: +34-911-96-45-44. Copyright statement: © 2014 by the authors; licensee MDPI, Basel, Switzerland. Prokaryotic community composition and ecology of floating macroscopic filaments from an extreme acidic environment, Río Tinto (SW, Spain). Specific jarosite biomineralization by Purpureocillium lilacinum, an acidophilic fungi isolated from Río Tinto.